What a party. ¡Gracias, La Sele! 8:24 Colombia-born coach Jorge Luis Pinto choked up when it was his turn to talk. (Borges introduced him by saying: “With what do we always eat eggs with?” “Pinto!” the crowd responded.) Pinto’s contract with Costa Rica runs out soon, and he’s likely coached his last meaningful match for La Sele. Fans chanted “Pinto don’t go” as he took the mike. An emotional Pinto seemed overcome by all the love as he struggled to speak to the thousands of supporters cheering him on. Some had been there since 7 a.m., if you can imagine that. “I’ll always carry this in my heart,” Pinto said. The three best performers at the World Cup were left for last: Joel Campbell, Bryan Ruiz and finally Saint Keylor Navas. Campbell gave his famous left-handed salute, then led the crowd in a chant that mocks all those that doubted the team (The spirited 22-year-old let fans speak the more profane parts of the chant). Keylor Navas then took the mike from Borges to thank the fans and the lead the crowd in another “oe oe oe” chant. All the players are on stage dancing around and having a ball. 7:30 p.m. After five hours in transit (thanks to thousands of people congesting the General Cañas Highway), La Sele at last has arrived in La Sabana for the tribute ceremony. The 16-kilometer journey took approximately five hours. The team, somehow still full of energy, is preparing to take the stage. Tico Times photographer Alberto Font said some fans — who had been waiting since the morning at Paseo Colón — started passing out in the evening. The Red Cross attended to 62 people during the event, according to La Nación. 7:12 p.m. Tico Times reporter Zach Dyer says 11 have been arrested during the celebration in Paseo Colón. Drugs and knives have been confiscated. 6:20 p.m. Bryan Ruiz takes a selfie from the trailing taking the team to Paseo Colón. La Sele has been on the transport for close to four hours now. 5:50 p.m. While we wait some more for La Sele’s arrival to Paseo Colón, here’s three more awesome photos of Tico players by the AFP. “If everything is possible, as you have taught us, then it is possible to Costa Rica to reach higher goals […] Thanks for the path that you opened, thanks for the goals that you scored, thanks for the goals that you stopped, thanks for carrying the colors of Costa Rica to the summit of the world of sports. Welcome home! And always forward! And here’s an aerial shot of all the mayhem on General Cañas. 4:10 p.m. La Sele still on the way to Paseo Colón. At this rate, the team might not get there until tomorrow morning. There are thousands of people clogging General Cañas Highway. One smart Costa Rican businessman has brought his ice cream cart out on the highway. 3:58 p.m. Back in Brazil, the faces of Brazil fans say it all. 7-1 Germany in the World Cup semifinal. 3:45 p.m. La Sele on the way to Paseo Colón. 3:22 p.m. A photo of the plaque recognizing La Sele’s historic run in Brazil. 3:15 p.m. President Solís tweets a photo of himself with captain Ruiz. The team now will head to Paseo Colón for the fan tribute. 3:00 p.m. With everyone now on the ground, the Costa Rica national anthem plays. 2:52 p.m. Jorge Luis Pinto and President Luis Guillermo Solís share a hug on the tarmac. 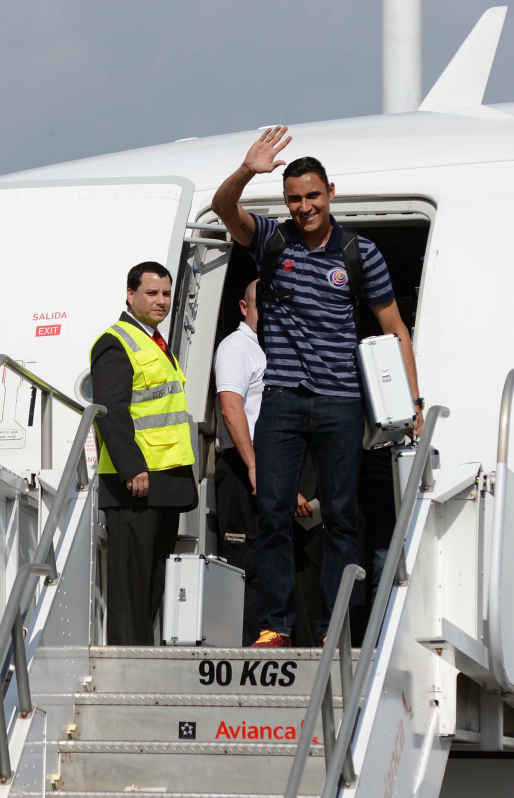 Michael Umaña and Giancarlo González were the first players to exit the plane. 2:48 p.m. Costa Rica head coach Jorge Luis Pinto is the first to leave the plane. Check out the red carpet welcome. Here’s an aerial shot of Paseo Colón from earlier today. Germany up 5-0 on the Brazilians in the first half of the semifinal. Insanity. 2:25 p.m. 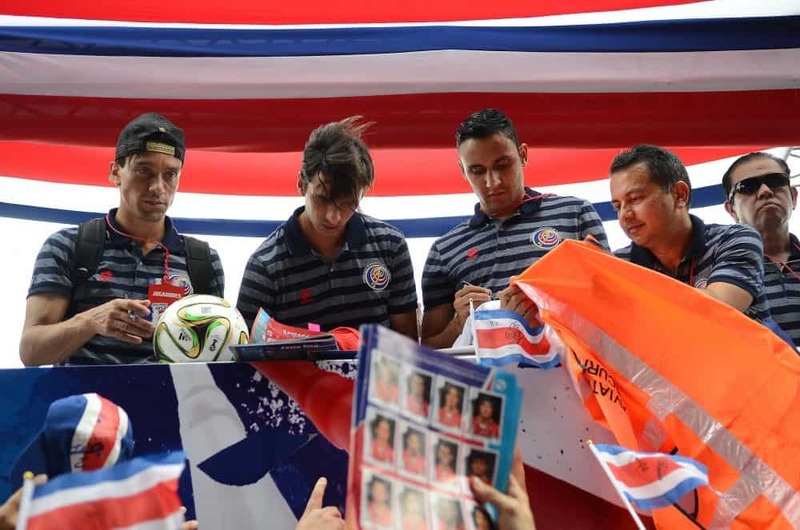 Team captain Bryan Ruiz stuck his head out the cabin while waving the Costa Rica flag. Thousands & thousands of Costa Rica Sele fans line the streets throughout the Central Valley to welcome team home, chanting "Sí se puede!" 2:14 p.m. The plane is making its descent in to Juan Santamaría International Airport. There are a lot of people waiting. 11 a.m. 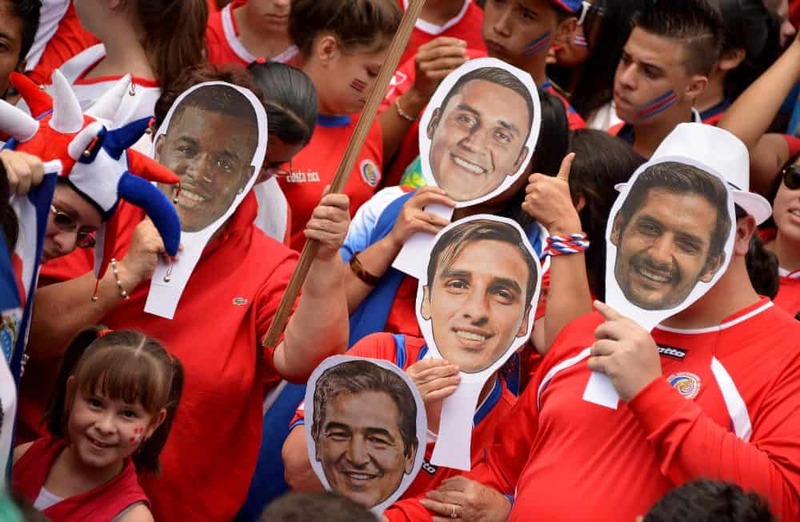 Fans showed up at San José’s Paseo Colón early Tuesday morning to prepare for the return of the Costa Rica men’s national team, known as La Sele. A ceremony to honor the team is planned for this afternoon. 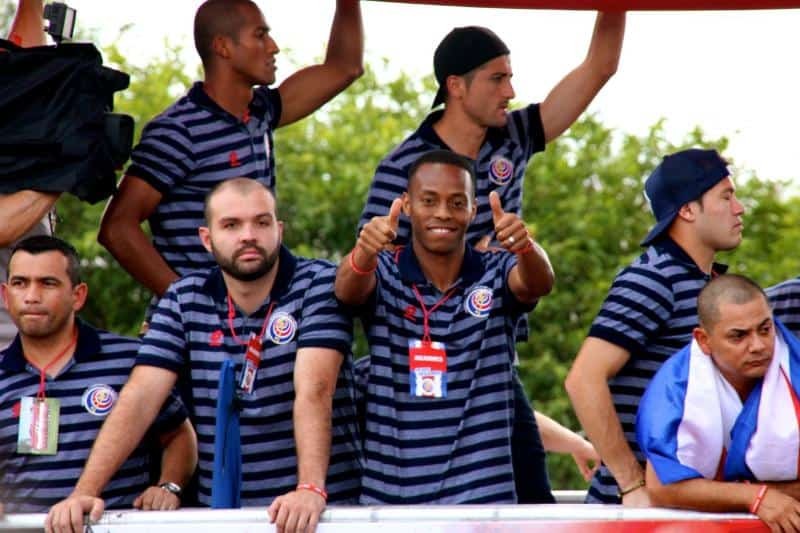 La Sele — which had a historic run at the World Cup in Brazil — was scheduled to return to the country around noon. However, the flight has been delayed two hours. Neither the delay nor the warm temperatures outside has deterred fans. 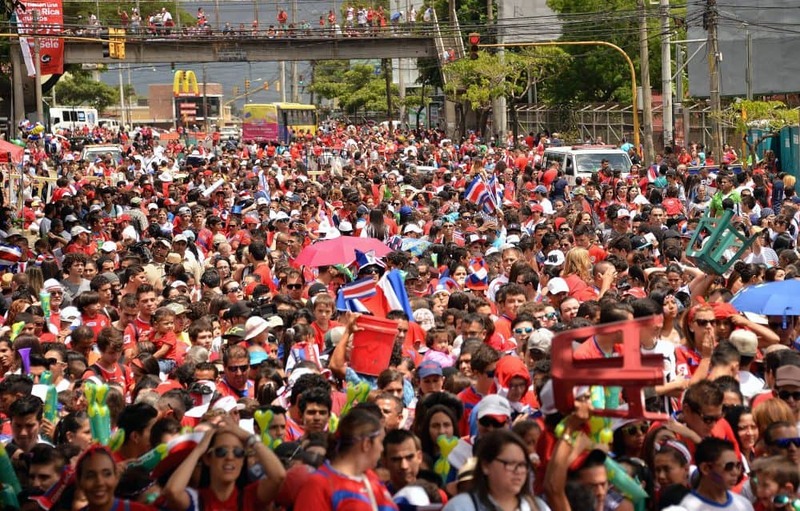 Thousands and thousands of enthusiastic Ticos have been gathering in western San José and at the airport, just outside the capital, to await the team’s arrival. 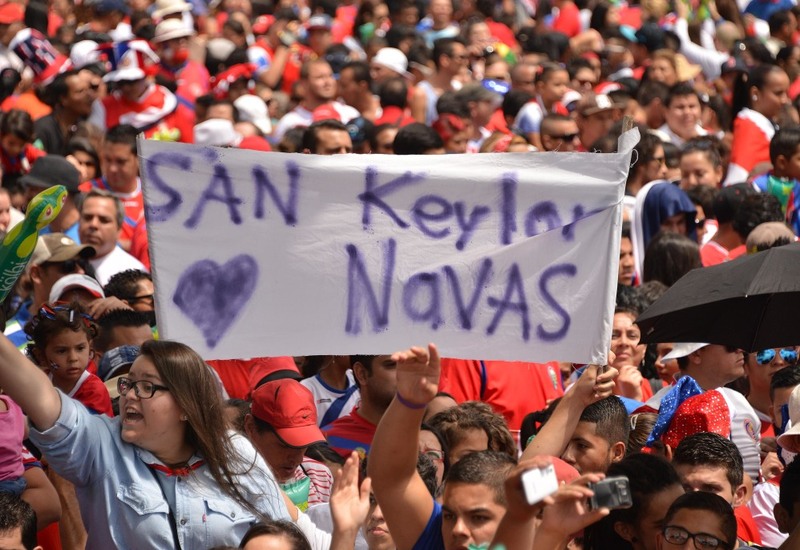 A fan in Paseo Colón made a simple change to the sign for Pavas to honor La Sele star goalie Keylor Navas.